I Don’t Smoke, but the Smokies Smoked Me! The reputation of the weather in Great Smoky Mountain National Park isn’t the best. It boasts something like 40 clear days per year. I got three of them. What a treat. 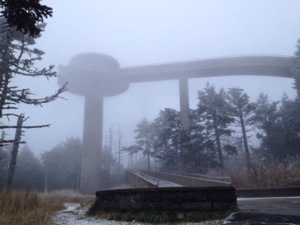 Even as I was hiking on Sunday across Fontana Dam, the southern trail head of the Appalachian Trail in the park, a kindly sheriff’s deputy stopped to ask if I knew that freezing rain or snow was expected Tuesday. Thanks, I replied. I did. When I started my hike from Springer Mountain, Georgia, I knew iffy weather was likely. I planned accordingly for inclement weather including freezing rain and snow. 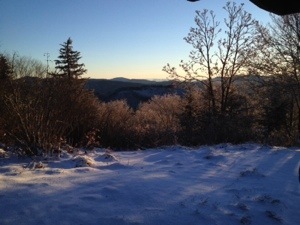 In fact, the first day was a 17 degree start with brisk wind. Researching the weather patterns before I left home, I realized anything was possible, but low temps in the mid-teens were the most likely. My gear was chosen accordingly. I have several layers, Pollyprop light weight and two pair of fleece gloves. I also have two ear bands and a knit hat. I left heavier versions of the aforementioned and mittens home. More on mittens later. The sleeping bag is comfortable to 20. Add the lightweight down jacket, long johns and dry socks and the mid-teens are a practical possibility. Due to bulk and weight. I determined not to carry down pants or booties which would bring the system to single digits. That was a mistake. Tuesday started pleasant enough. 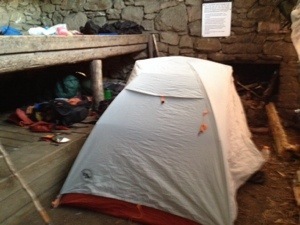 After a night alone at the Siler’s Bald shelter, I hit the trail at 7:30 with a royal blue rain cover on my red pack. Nice patriotic combo, I thought. The sky was clouding to the west contrasted with a brilliant sunrise in the east. I hoped for snow over rain. It’s much easier to handle. The wind began to howl around 9 a.m. As pellets of freezing rain spit from the west a half hour later. It reminded me of winter hikes in Colorado. I put on my rain/wind pants and jacket, opened the pit zips to manage the heat build up because I was climbing to the Clingman’s Dome observation tower. At 6,643 ft, it’s the highest point west of the Mississippi. Great place to be in a storm. So far, so good. Temps in the 20s. Everything manageable. Snow accumulation around two inches. Not bad. I nailed the planning, or so I thought. 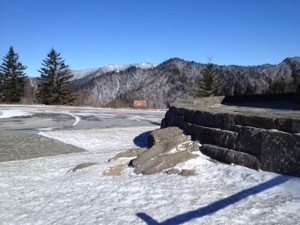 I made six more miles to New Found Gap, the road to Gatlinburg. When in strode across the highway, park rangers and county sheriff’s deputies were closing the highway. The pavement was glazing. That should have been a warning to me that temps were dropping like the New Year’s ball in Times Square. Instead, my mind was on the three vertical miles to Ice Water Spring that I had to make in 90 minutes. So, up and onward I pushed. Weather be damned. All I had to do was get to the shelter and all would be well. During the final three mile climb, my fleece gloves began to freeze in spite of the tremendous amount of body heat I was generating. My fingers went numb. I cursed myself for not bringing water resistant mittens. So much for the average weather. On the way up I met harbingers warning me to turn back. Ironically, among them were Magnet and her band of party animals from the flash mob in Shenandoah National Park! Smart decision folks. Flash forward. The snow was drifting a foot deep or more by the time the ironically named Ice Water Spring Shelter came into view. The roots and rocks along the trail were glazed with ice. Worst yet, the temp was falling faster than Congressional popularity ratings. My phone was frozen. No pics. Sorry. Once under cover, my fingers were so stiff that I could barely manage buttoning my dry shirt. My Deuter pack lacks the buckle tabs needed so gloved hands can unloosen them. I do not recommend Deuter packs for this reason. Realizing that the temperature could drop to survival levels, I layered up my clothing and covered my sleeping bag with the rain fly of my tent to cut the wind and harbor precious heat. In the shelter were three young southbounders whose clothes were wet. Some wore cotton. One erected his tent for added warmth. Smart. They stayed awake all night just to survive. Lucky them. I cat napped, but my sleep system was at the edge. At 7 a.m., the temp in the shelter was 5 degrees. Outside the ice crystals danced on the knife edge of the wind. We survived the night. Lucky us. The southbounders planned to escape to Gatlinburg to dry out and warm up. I attempted to march on, but crashed on the icy trail twice within 20 min. It was Gatlinburg for me too. The trail needed a day to thaw, not to mention another grossly low overnight temp was in the forecast. Discretion is the better part of valor. So, here I sit in a hiker-friendly motel. My fingers are still numb. I bought some micro spikes in case the trail bed remains icy. Laundry is done. Plans to make Hit Springs have been revised. It’s all about the challenge. Well done , hope the weather turns good, the fun parts gonna be looking back with satisfaction….great blog ..thanks..! 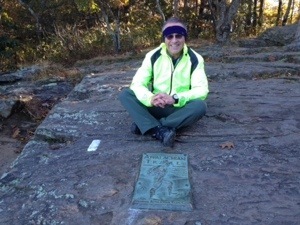 Best wishes for an enjoyable & memorable trek as you continue your adventures along the fabulous Appalachian Trail!! What Date did you start at Springer? Im playing on starting early April with a 20 degree bag but this post is making me question my decision. 5 Degrees! Good grief. I started from Springer Oct. 24. I have a 20 degree Dry Down bag supplemented with a down puffy jacket, pants and booties. I was not carrying the latter two. Add them and a fleece hat and I can comfortably go to -5 or so.